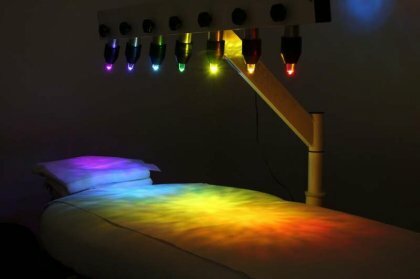 I am delighted to have recently received my Crystal Light Bed, and having seen the healing properties it has, I felt it would be a valuable addition to use this crystal light therapy combined with my Reiki treatment at my treatment rooms in Fulham, London. It is important to get the client into a good healing space, so I will spend 30 minutes doing Reiki, probably around the head and chest area, to fully relax the client which in turn will open the rest of the body up for further healing with the crystal light therapy. After about 30 mins, I then finish the session with some more Reiki on the feet which will bring you back and ground you. This, however, does not mean that everyone will want the Crystal Light Bed, so a full Reiki session is very much still on offer! A crystal bed comprises of 7 exceptionally clear and well-polished Vogel cut quartz crystals, suspended around 12 inches above the client who is relaxing on the massage table. The client receiving the healing session, is lying face up with their eyes closed, bathing in the energy. Each of the Vogel quartz crystals has been cut to a precise and specific frequency which is then brought in to line above one of the seven human energy centres, also known as Chakras. The coloured lights, each of which have been chosen to match the specific vibrational frequency of each Chakra, radiates colour, light and energy through the crystals to each respective energy centre. The crystal beds lights glow in particular rhythms that help to cleanse, balance and align your natural energies. Feeling more energised: clear thoughts-ability to focus. Feeling a deep relaxation: a connection to the earth and/or universe. A deeper spiritual understanding of themselves and their life situations. Gaining insights into their future life path and the evolution of earth. Receiving guidance as to how to best deal with their disease or problems. "I had chosen Georgiana because of her powerful healing energy. On my second visit, I was lucky enough to be introduced to Crystal Light Therapy. After hearing the story behind it, I was quite excited to give it a go. I found that, together with Georgiana's energy and that of the Light Crystal Bed, I had the most unimaginable experience. I had problems with my knee before this (amongst my other problems), but not anymore it may appear. After about twenty minutes into my session, I started feeling a light tickling sensation on my knee, not once but twice. I did not think much of this. I stood up and felt fully energised and what felt like a spring to my step. I walked so much faster and even sprinted for transport straight after. When once my knee felt hot to touch, now it is as cold as my other one. Once in a while I have an odd sensation in my knee but no discomfort. I have since had another session with Georgiana and the Crystals and am pleased with my amazing experience. Now I am looking forward to more."